Lighthouses, of course, have been a practical, life-saving tool for many mariners and others who have counted on these aids to navigation, to help guide them through dangerous waters. But for many (like myself) who are avid lighthouse lovers, there is also something magical about them that helps capture the imagination. My journey of visiting lighthouses began in 2013, when I first visited Absecon Lighthouse, the tallest lighthouse in New Jersey, and the third tallest in the United States. Since then, each year, I have made an effort to experience lighthouses in a different way. In 2015, this included a day-long boat cruise to see 10 lighthouses along the Chesapeake, from the MV Sharps Island Boat. This year, I asked myself how I wanted to experience a lighthouse in a different way in 2016. And the answer was easy: a nighttime climb! Some lighthouses offer full moon climbs several times a year during a full moon. 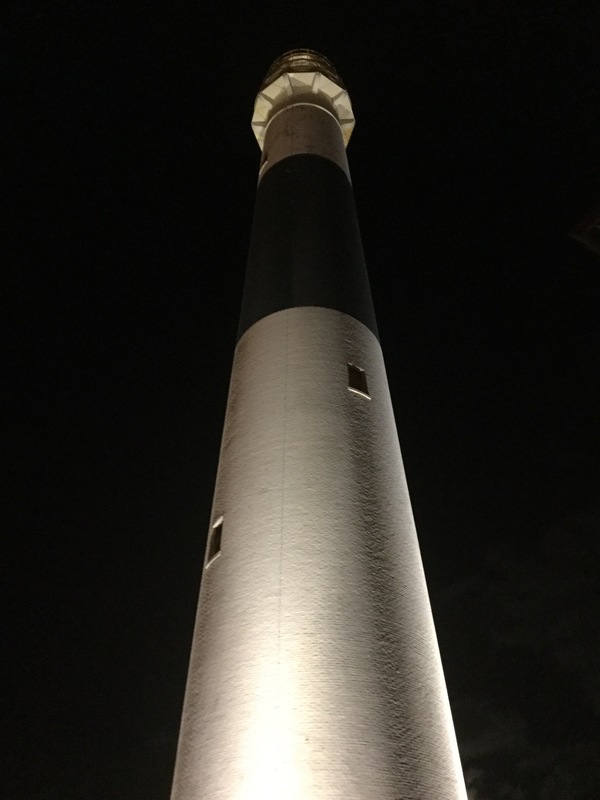 On Friday, September 16, I returned to Absecon Lighthouse for their last full moon climb of 2016. The doors opened at 6 PM, and the last climb was at 8 PM. I made sure to time the walk from the hotel to the lighthouse just right. I could see the lighthouse from the hotel room, and once I saw the light come on at Absecon (or “Abby” as she is affectionately called), I knew it was time to walk to the lighthouse. Absecon Lighthouse just as day began to turn to night, September 16, 2016. 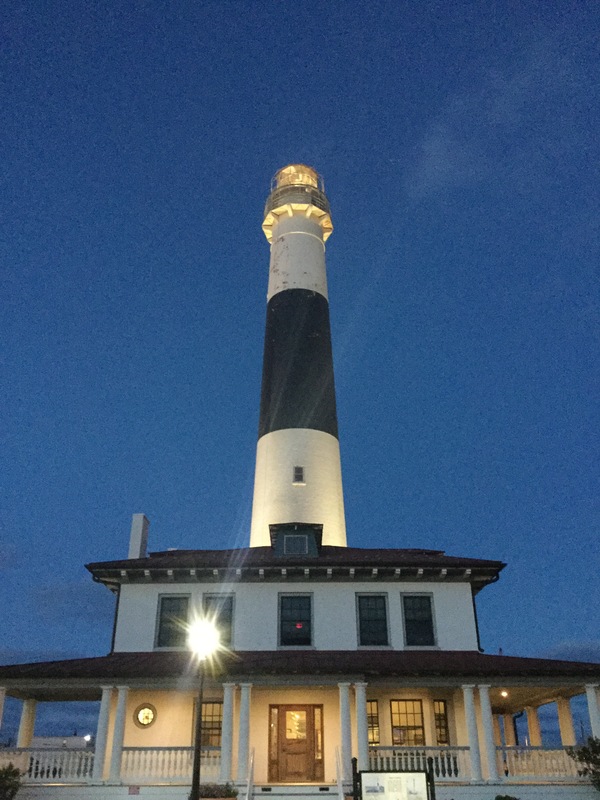 Upon arriving to Absecon, it instantly became clear that the lighthouse takes on a different feel at night, than it does during the daytime climbs. 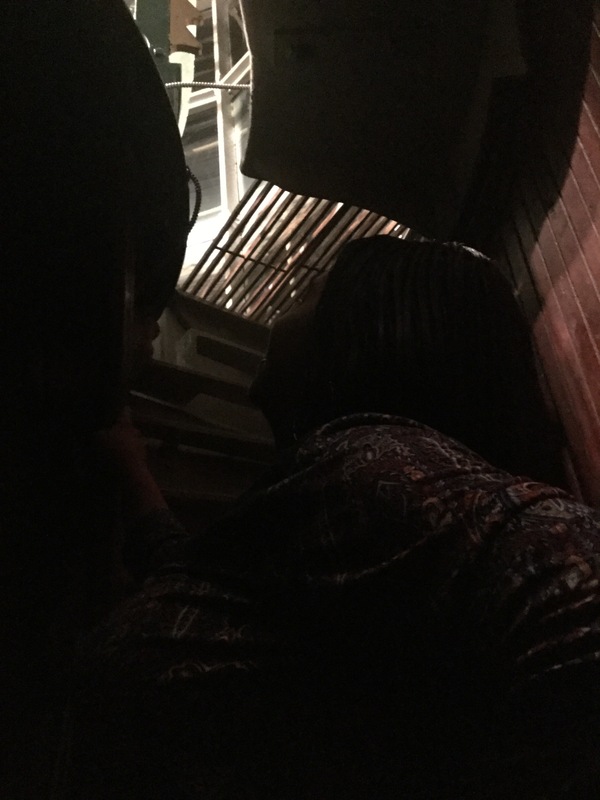 As I began the climb to the top, I noticed that the spiral staircase was lit, to guide visitors going up, and coming back down. Absecon’s glorious spiral staircase, leading you up, and back down, 228 steps. 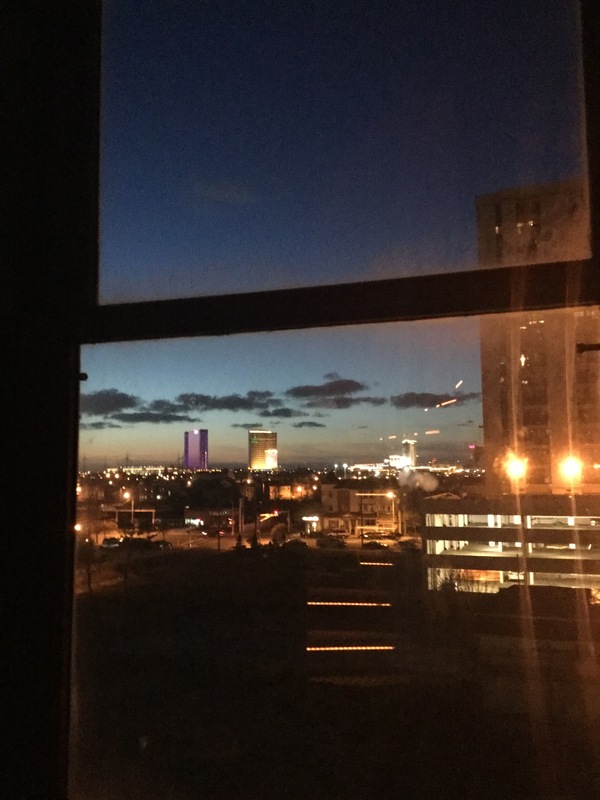 I took advantage of Absecon’s six landings, where you can stop, catch your breath, look out the windows and experience different views of Atlantic City, and read historical information about the lighthouse and some backstory on the view you are witnessing. 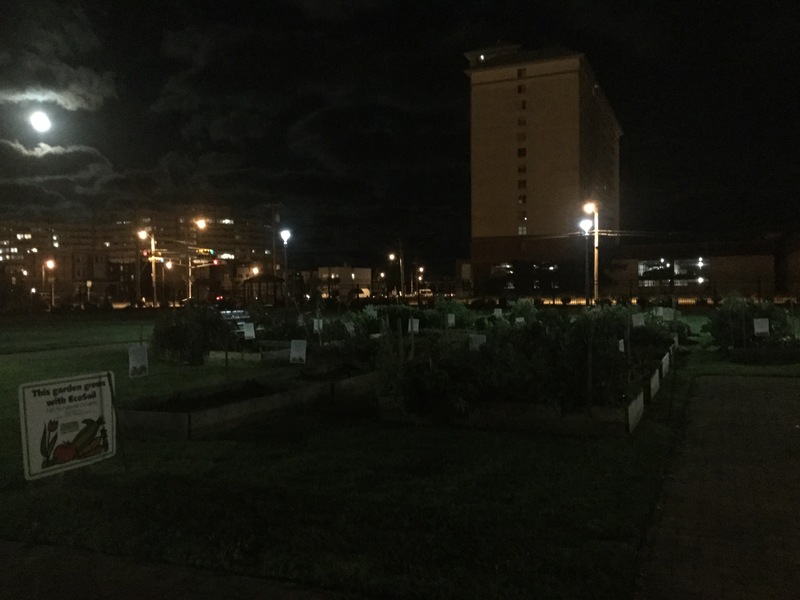 Stopping at each landing on this trip to Absecon, was made even more magical by the full moon shining, and the various views of Atlantic City at night, with the lights from the hotels and casinos shining brightly. 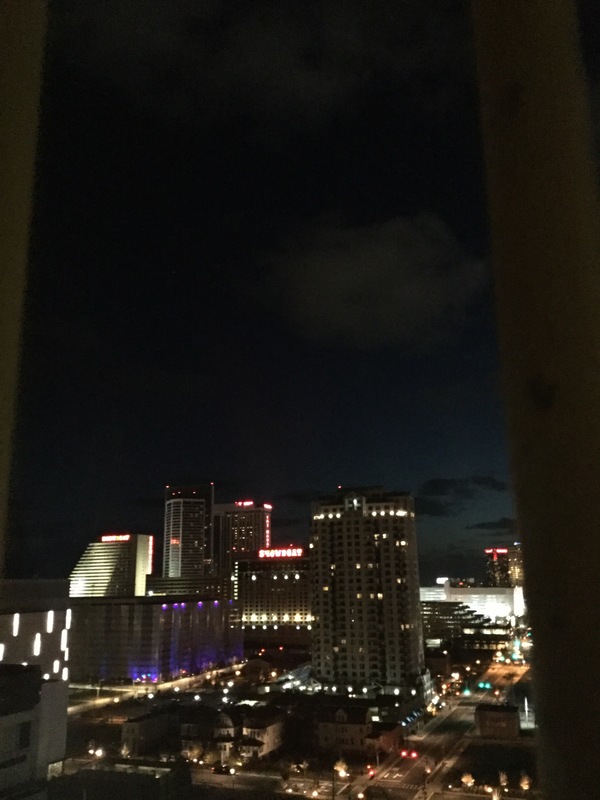 On one of the six landings, taking a moment to appreciate the view of Atlantic City, before making the rest of the way to the top of the lighthouse. 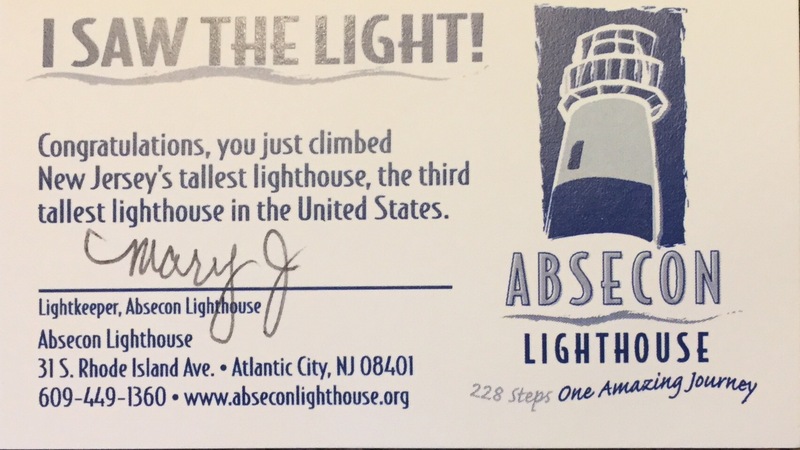 I reached the top and was instantly, and warmly, greeted by Mary J., the volunteer light keeper on duty, and received the “I Saw The Light” card that one always receives upon successfully climbing 228 steps and reaching the top of Absecon Lighthouse. I stepped out on to the walkway and soaked in the incredible view of the full moon and chatted with other visitors just as in awe as I was. The view was so amazing, I felt I could have stayed out there forever. 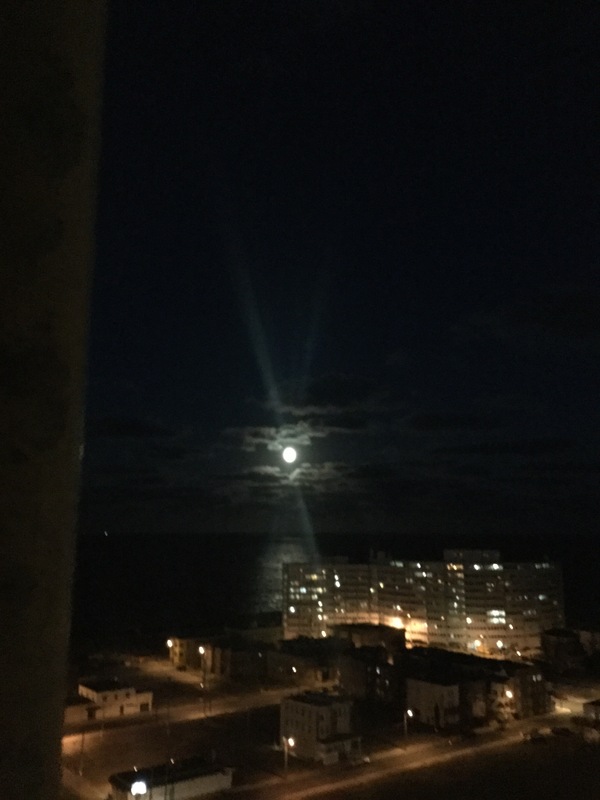 Nowhere but to the top: looking out at Atlantic City from the top of Absecon Lighthouse during the Harvest moon climb. Finally, I stepped back inside and inhaled the view of the first-order fresnel lens I was seeing. 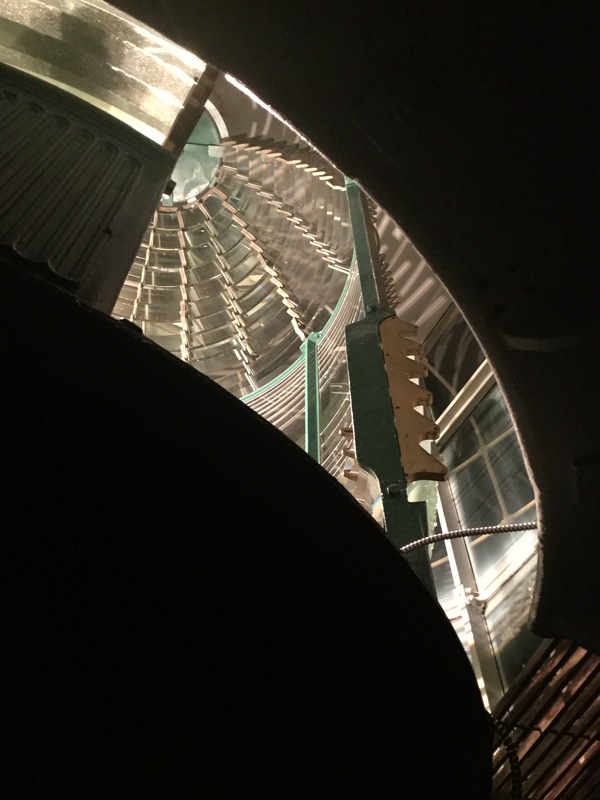 Although this was my third time seeing Abby’s fresnel lens, like so many other things about the lighthouse, it takes on another dimension at night, and I imagined Abby’s previous lighthouse keepers climbing the 228 steps with heavy oil canisters, to ignite the light each night as the sun would begin to set. 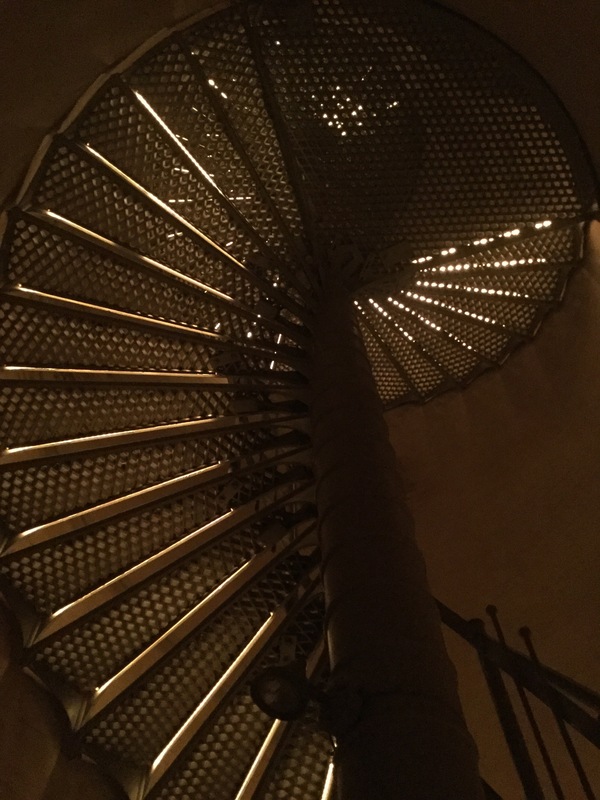 After a farewell and thank you to Mary J., I made my way back down the spiral staircase. I stopped back by the gift shop to collect the items I had purchased when I first arrived to the lighthouse that night, and walked outside. Before leaving the lighthouse grounds, I took a few more photos of Abby in all her glory, including her beautiful garden. If you have never experienced climbing a lighthouse during a full moon, reward yourself by making plans to do so in 2017. 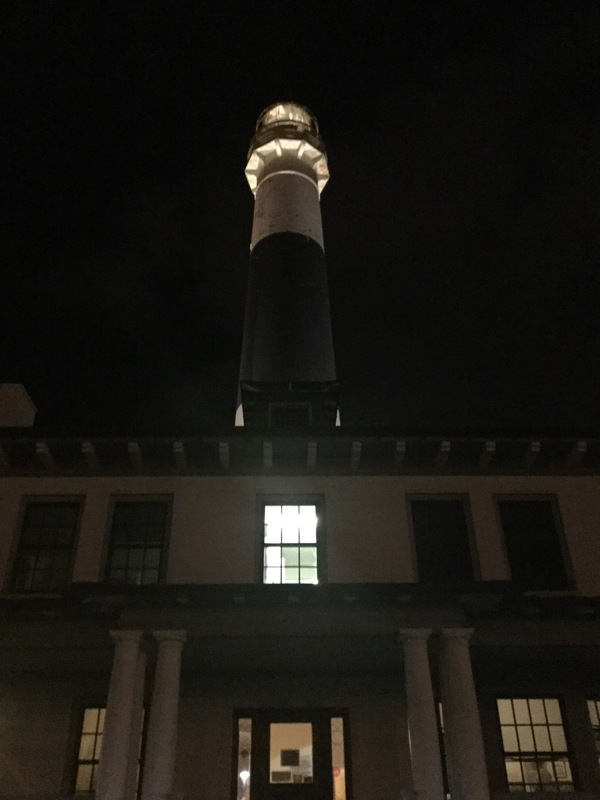 → Abby at 160: Happy Birthday, Absecon Lighthouse! Looks like a ton of fun. The lighthouses up here are not open for touring at night. But we can still photograph them with the moon. Thank you so much! And yes, it was fun indeed!